Sorry I missed last week. A friend went to the hospital suddenly and needed some help getting an overnight bag. Someone else wound up taking the bag to him, but he’s younger than I am and in the hospital. It re-focused my brain for a bit. Frank (Joel Murray, younger brother of Bill Murray and Brian Doyle Murray) is a guy who believes in common courtesy, empathy, and respect. He treats a female co-worker with kindness and gets fired. His doctor diagnoses his headaches as being caused by a terminal brain tumor. His daughter lives with his ex-wife and refuses to see him. He decides that a reality TV spoiled brat is emblematic of everything wrong in America, and decides to kill her. If that sounds dark and violent, you’d be surprised by how funny and touching it is. Bobcat Goldthwait wrote and directed the movie. Joel Murray takes us on Frank’s journey, as an ordinary guy who no longer understands the world around him and has nothing left to lose. It’s not a perfect movie, but it’s a very good piece of satirical commentary on a society where many of us seem to feel good only when we can mock others. Sam (WWE’s John Cena) is on suspension from the police after beating a child molester who was found not guilty. He is the older half-brother of Leo (Ethan Embry, FreakyLinks, Once Upon a Time, Harold & Kumar Go to White Castle, etc. ), a bail bondsman who’s out a quarter of a million dollars because of a skip. Sam and Leo are the older half-brothers of Douglas (Boyd Holbrook), a thief who just got out of jail. When their alcoholic, abusive, womanizing father dies, their sister Nina (Amy Smart, Felicity, Crank, Road Trip) calls them home for the funeral. When they hear the will, they discover they’ve each inherited $3 million, but there’s a catch. In order to inherit, they have to work together for two years. Leo hates Sam because Sam was physically abusive. Neither one of them knew Douglas before the funeral. Douglas is a sweet kid who is thrilled to have a family, but Sam and Leo feel like he missed the worst behavior of their father and therefore doesn’t share their life. Does this sound like too much set-up? Because it was way too much to set up the idea that Leo’s skip kidnapped a millionaire, whose family is offering a huge reward for information leading to his return. The whole point of the movie is the bonding experience as each brother brings some skills to an adventure in Mexico. Overall, it’s not bad. It’s just not good enough to go out of your way to see. Dax Shepard (Zathua, Idiocracy, Parenthood) and Kristen Bell (Veronica Mars, House of Lies) may be the cutest couple in Hollywood right now. Annie Bean (Bell) lands an interview for a plumb teaching position in Los Angeles. Her fiance, Charles Bronson (Shepard), is in Witness Protection, guarded by a Federal Marshal named Randy Anderson (Tom Arnold). Charlie isn’t supposed to leave the town where they live without permission from the marshals. He specifically shouldn’t go to LA, because that’s where his old gang hangs out. Charlie is the assumed name of Yul Perrkins, who turned state’s evidence against a gang of bank robbers led by Alex Dmitri (Bradley Cooper, The Hangover, Silver Linings Playbook, American Sniper). Charlie decides that his relationship with Annie trumps everything, and he will get her to that interview, no matter what. Except he wasn’t counting on Annie’s ex, Gil (Michael Rosenbaum, Smallville), ratting them out to Dmitri in a fit of jealousy. This is an old-fashioned American cross-country car chase movie. If you cut your teeth on Gumball Rally and The Cannonball Run, you’ll get a kick out of this. If not, you should know that Charlie and Annie talk to each other like a real couple trying to communicate difficult issues. I felt like I was finally watching a movie that didn’t depend on people not talking to each other, and that’s a compliment. Did you hate the Pirates of the Caribbean movies? If so, avoid this movie like the plague. If, on the other hand, you enjoyed at least the first of those movies, then this movie is not as bad as you’ve heard. Let me start by saying that I am too young to have listened to the Lone Ranger radio plays. I am too young to have watched the TV show during its run. However, I am old enough to have seen the show in syndication, and old enough to remember Lone Ranger comic strips in newspapers. Also, I had a Lone Ranger action figure when I was a kid, complete with his horse, Silver. 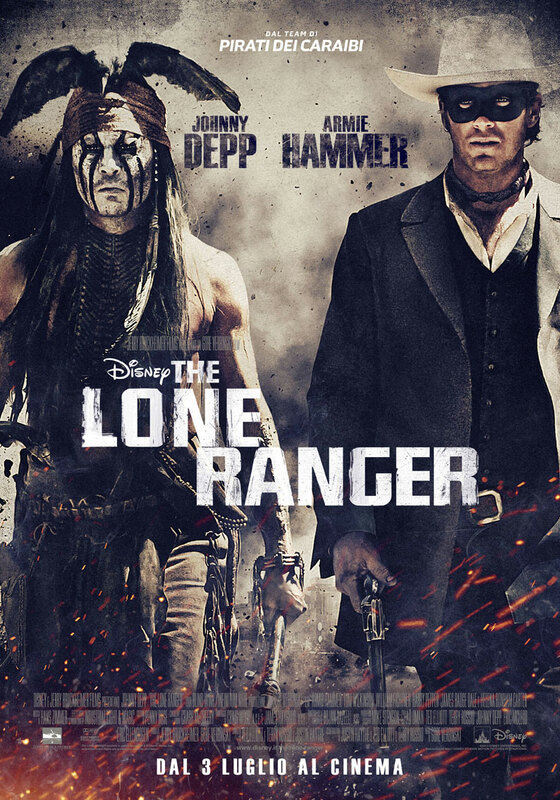 So, yes, I was disappointed by the comedic choices of John Reid/the Lone Ranger (Armie Hammer) and Tonto (Johnny Depp). I mean, at some point, somebody needed to realize that there was no Disney ride to protect. This was not a kids’ movie. This was a movie with complicated racial politics (Native Americans and white settlers), gunfights, kidnappings, knife fights, and murders. To be fair, the movie takes the serious parts seriously. Tonto’s backstory explains his unusual behavior, for example. I feel like there was a good Western adventure story in there that was tied in a sack and beaten with shoes by the need to conform to an existing property. Hey, Hollywood: Nobody in your most valuable demographics has any emotional connection to The Lone Ranger. You could have made this a completely new property, untied the writers’ and director’s hands, and probably come up with a better movie. Okay, please don’t hate me. I have not yet seen the Korean original of this movie. I’ve only seen the Spike Lee version with James Brolin, Sharlto Copley, and Elizabeth Olsen. I promise I will see the original. This movie is not for the faint of heart, okay? It’s a brilliant, dark, tale of violence and revenge, and how those ideas can consume a person. Joe Doucett (Brolin) is an alcoholic advertising exec who routinely pisses people off, including his ex-wife. One day, he goes home with a woman. When he awakens the next morning, he’s in a hotel room with no doors or windows. For 15 years, he’s a prisoner. The television in his room is always on, and is how he learns that his ex was brutally raped and murdered, and that he’s been accused of the crime. The TV occasionally revisits the crime, following up on developments, and showing Joe that his daughter is still alive. Then, one day, his captors dress him in a new suit and leave him in a box in a field. A cell phone in his pocket connects him with a man’s voice, and that man challenges Joe to figure out who kidnapped him and held him prisoner. This movie is unflinching in its depictions of violence and brutality. No one escapes untouched by events that Joe himself set in motion. I did not enjoy this movie. You don’t enjoy this kind of material. I did think it was powerful and worth seeing. I will definitely see the original. Donald E Westlake (who wrote the 24 Parker novels as Richard Stark) was one of America’s great crime fiction writers prior to his death in 2008. You may not realize that this is significant, and that’s because Hollywood likes to change things up. In fact, Point Blank (1967, with Lee Marvin), The Split (1968, with Jim Brown), The Outfit (1973, with Robert Duvall), Slayground (1983, with Peter Coyote), and Payback (1999, with Mel Gibson) are all Parker movies. This is just the first movie where Westlake’s character is actually called Parker. Parker is a ruthless professional criminal with a strict code of professionalism that sanctifies efficiency. For the most part, Jason Statham embodies the character well. There’s just something comedic about seeing him in a Stetson and faking a Texas accent that suggests a lighter tone than the rest of the movie can support. The action is brisk, the plot is taut, and the violence, while brief, is brutal. It shows its roots in film noir, but never really embraces the tropes and conceits of that genre. I was hoping for a funnier film, something more along the lines of 1972’s The Hot Rock, where Robert Redford played Westlake’s more comedic character, Dortmunder. Instead, I got a film that was a cut above most of Statham’s recent action movies but not good enough to recommend. Jack Ryan is a character created by Tom Clancy. Alec Baldwin (Hunt for Red October), Harrison Ford (Patriot Games, Clear and Present Danger), and Ben Affleck (The Sum of All Fears) have all played the character before this. 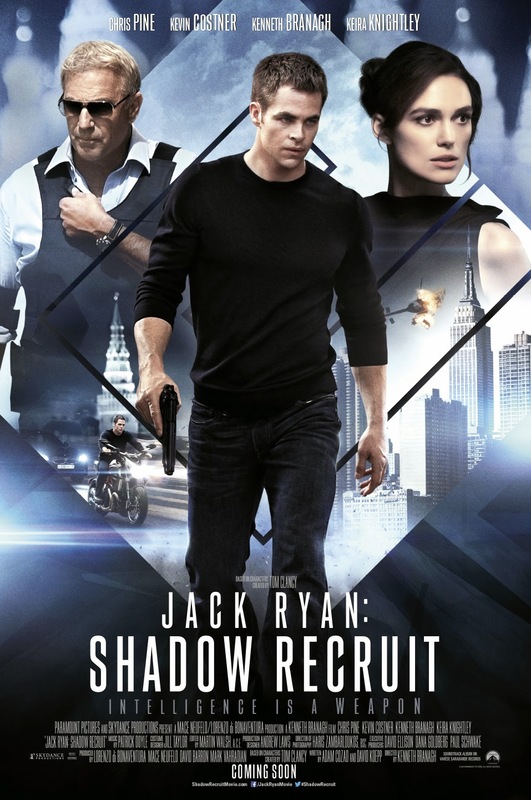 In this movie, Chris Pine (Smokin Aces, Star Trek, This Means War) plays Jack Ryan. The movie covers Ryan’s transition from the Marines to the CIA. Everyone in the movie (which includes Kevin Costner and Keira Knightley) performs well. It just doesn’t gel. This was conceived as a reboot of the Tom Clancy espionage franchise. While it acquits itself honorably, it’s just not exciting enough to spark anything. The vast majority of the people who went to see it on opening weekend were 50 or over, meaning that despite casting Pine it did not attract a coveted younger demographic (only 15% were under the age of 25). 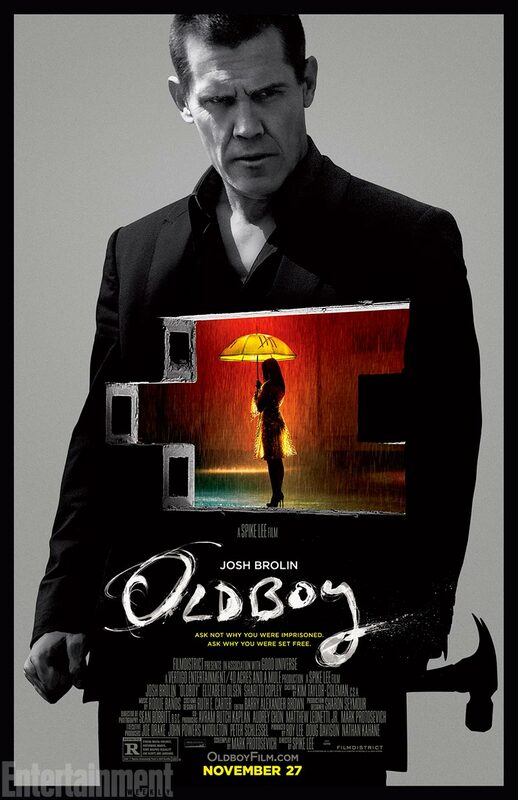 What I liked about it was that Viktor Cherevin (Kenneth Branagh) was a strong antagonist. He had a visceral motivation for his actions rooted in personal pain and suffering. His plan seems solid (and the movie sells it well), and best of all does not require outrageously good luck to succeed. It carried personal risk, for him, but his backstory gave him reason to accept that risk. The problem is that the protagonists lack motivation. Yeah, yeah, patriotism and professionalism, blah blah blah. There’s nothing visceral about why they get involved. It should be a big deal when Jack gets into a helicopter (or any aircraft) after his crash and near paralysis, but it isn’t. It should be a big deal when Jack figures out things about the plot, but any professional on the team should have figured those things out. Computers solve problems too quickly for tension to develop. I’ve seen all the Jack Ryan movies, and this one lacked the epic scope and vision of the others. I’d like to recommend it, but I can’t. If not, I appreciate feedback on everything from content to format. If you do enjoy it, my wife and I do appreciate donations of any amount. ← Crazy Uncle Rich’s Next Kung Fu Theater!